As mentioned here, wafting down the Tarn Gorge this summer with a Watershed Chattooga drybag jammed under my knees gave me plenty of time to configure what kind of ‘deckbag’ I felt would better fit my needs. 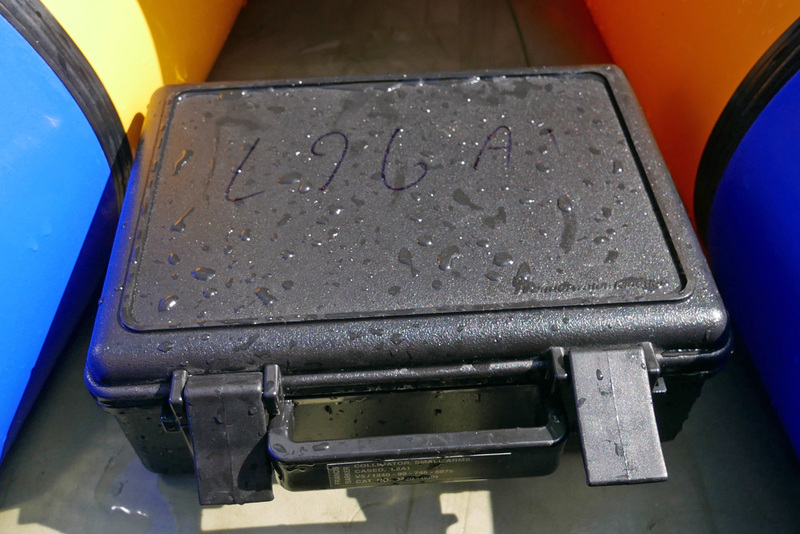 Peli cases were too heavy and cumbersome for these sorts of trips, while dependably dunk-proof – or even submersible bags like the Chattooga are too big and too fiddly to seal easily. I just needed a 5-litre bag to sit on the floor below my knees for my must-stay-dries and camera. Using state-of-the-art Adobe Crayon™ CAD software I came up with a design (above left) and optimal dims of about 29cm x 15cm wide by 12cm deep giving about 5 litres volume. 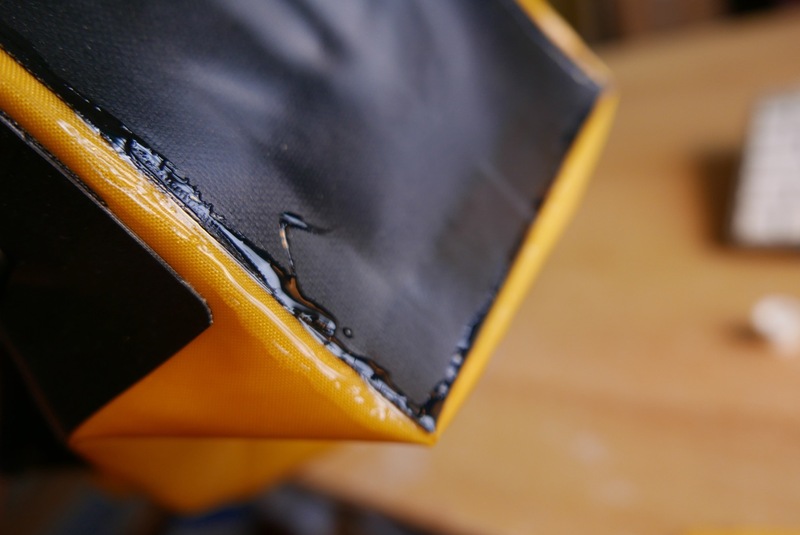 Part of the attraction of this project was learning to heat-weld TPU fabric with a small iron. It looks so much easier and less messy than glue. Or so I thought. 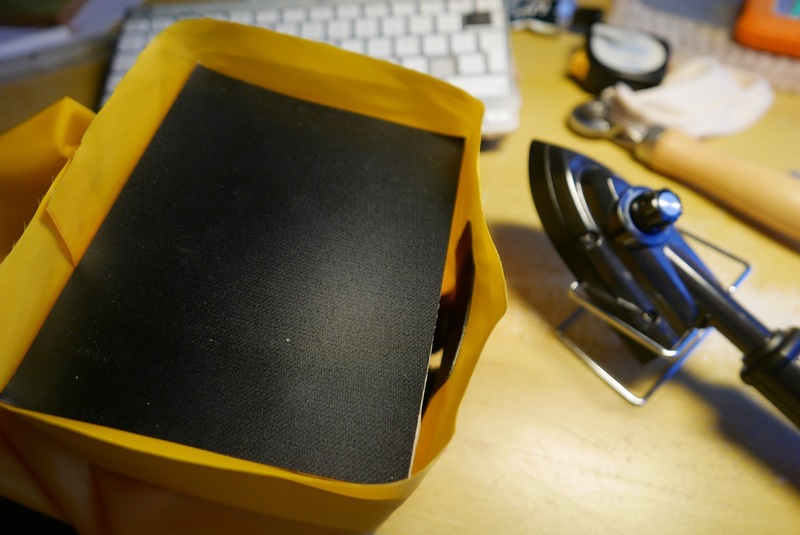 Before I got – quite literally – stuck in I considered adapting some of the many heavy-duty SealLine PVC roll-top dry bags I have knocking about. All I needed to do was stick a zip in, then somehow cap one end with a round piece of something. I may well try that later but what I was actually aiming for was a stable box not a cylinder to sit securely on the floor of a boat. And fyi, PVC can’t be heat sealed with an iron because it’s double coated. 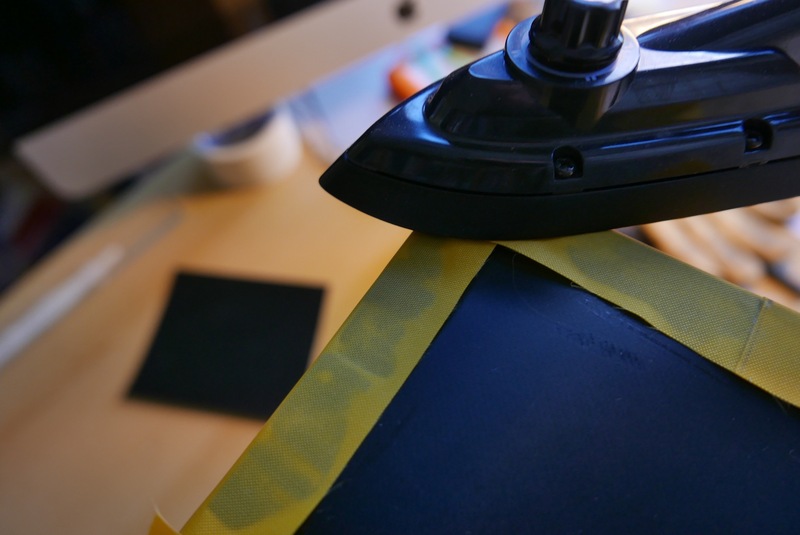 With double-coated anything (TPU or PVC) you need to use a heat gun and a roller which requires three hands. Or a one-sided seam tape. Or just glue. 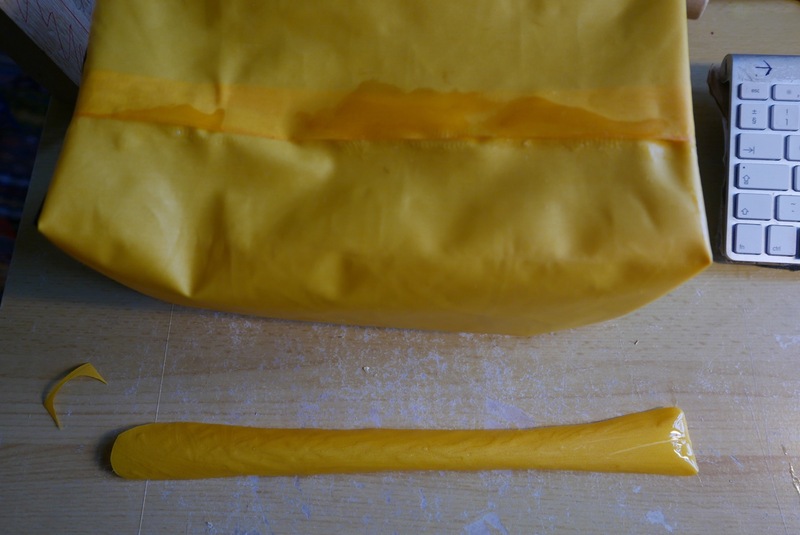 The body of my Pakbag could be made from single-coated yellow 210D packraft hull fabric, with the near-square end panels in ‘both-sides-coated’ 420D black packraft floor material. At 650g/sqm (27oz/sq yard) this stuff is good and thick. 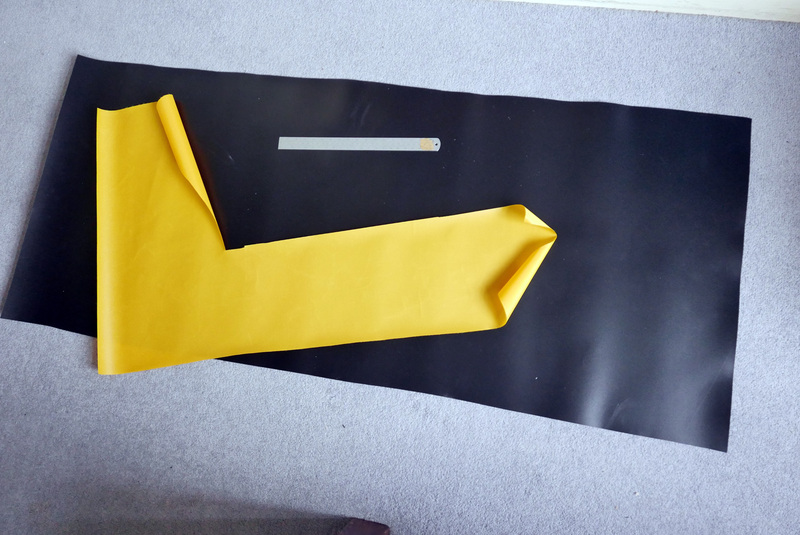 The thin yellow is 275g/sqm. 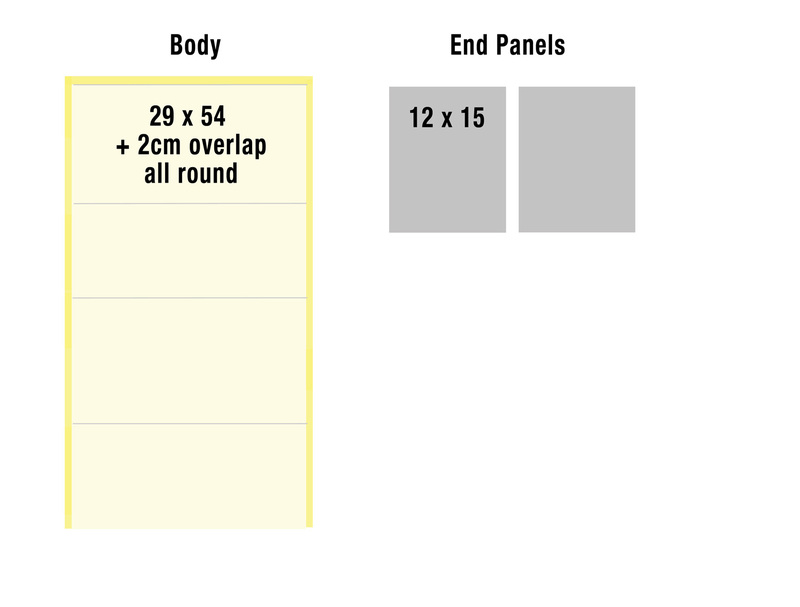 Half a metre minimum order of each cost 10€ and 20€ respectively from extremtextil in Germany; a very handy resource for the home fabricaiser. What you see is what’s left over. Extrem were also one of the only places I found who’d sell a couple of 23-cm TiZip MasterSeal 10s for €23 each. Rolled delivery cost a bit more but avoided folds and was very fast. 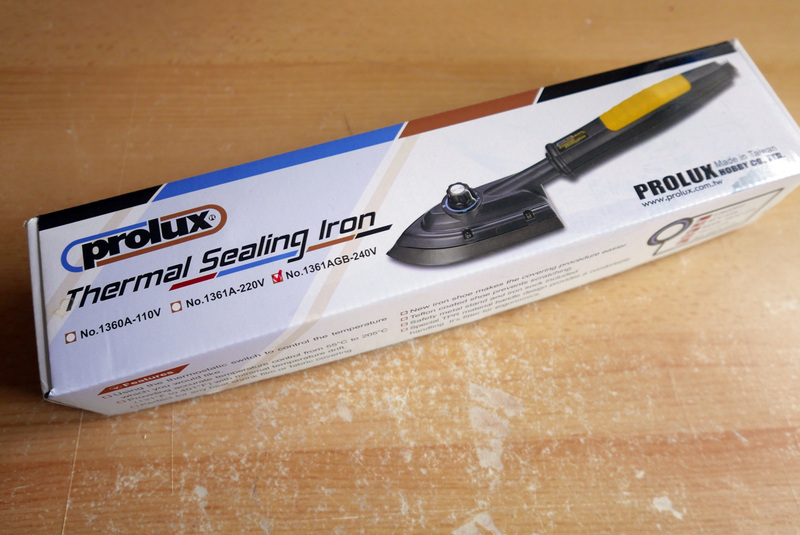 In the meantime I won a used Prolux iron off ebay for 20 quid and already had some scissors, a table, a ruler and a knife. I’m not so skilled at home handicrafts so expected to make a right mess of things first time round, and was prepared to make a second bag. 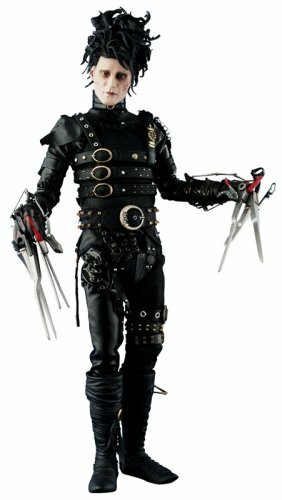 The next best thing I could do was think carefully before diving in like Edward Scissorhands at a confetti convention. 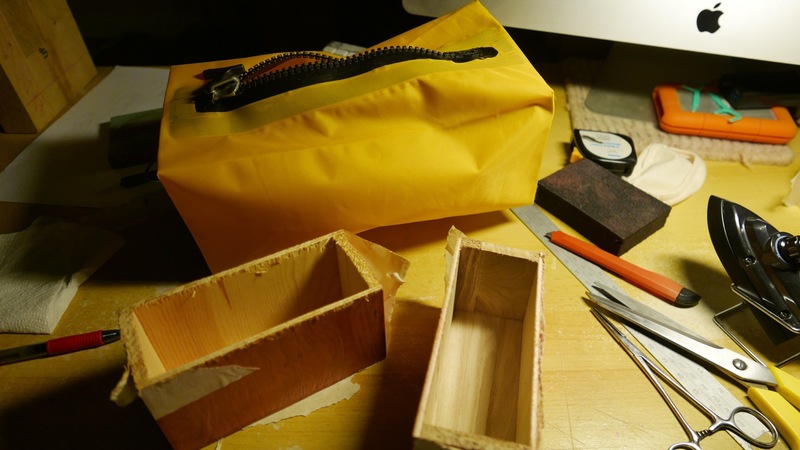 One smart decision I made was to use a wooden mould to form the bag around. I could have laboriously hand-sawn some kitchen-shelf leftovers down to size, but after more ebaying found a pair of hobbyist’s knick-knack balsa boxes which added up to 15 x 12 x 30 stacked. As mentioned, you can’t iron on the coated side of TPU fabric; the coating will melt all over your iron before it bonds to whatever’s underneath. You can only directly heat an uncoated surface while pressing down the coated side which melts to the corresponding panel – coated or uncoated. 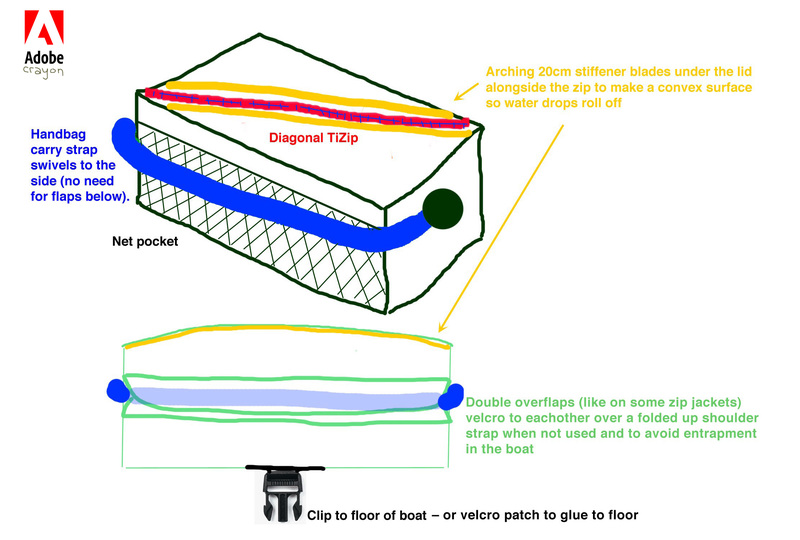 You can learn a lot from the DIY Packraft website. Lord knows how these guys manage to make packrafts from a roll of raw TPU. There can be no doubt that my attempt would end up looking like Picasso in an abattoir, but a dinky, curve-free pakbag ought to be within my abilities. They mention the need for an iron with an adequate and consistent spread of heat up to around 220°C. Rated at 205°C, my cheapo Prolux was not in this category. I understand model makers find them ideal for applying thin transfers. 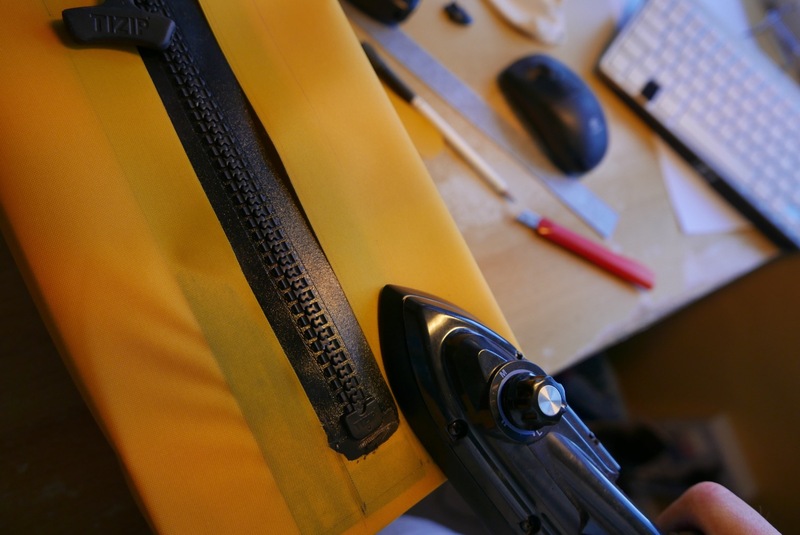 For TPU work you need an iron with more poke, costing at least three times as much. I practised joining 210D to 210D, but sealing was far from instantaneously miraculous. It took repeated ironing and pressing, as well as spot heating to get a full seal with virtually no air gaps or lifted edges. You could then peel it apart if you got an edge up, but you certainly couldn’t pull it apart. I thought maybe the coating may be too thin or once melted was gone for good, but it’s probably just my crap iron. For the end panels you need to seal 210D on to the thick black 420D. The box mould really helped to make a neat-enough job. 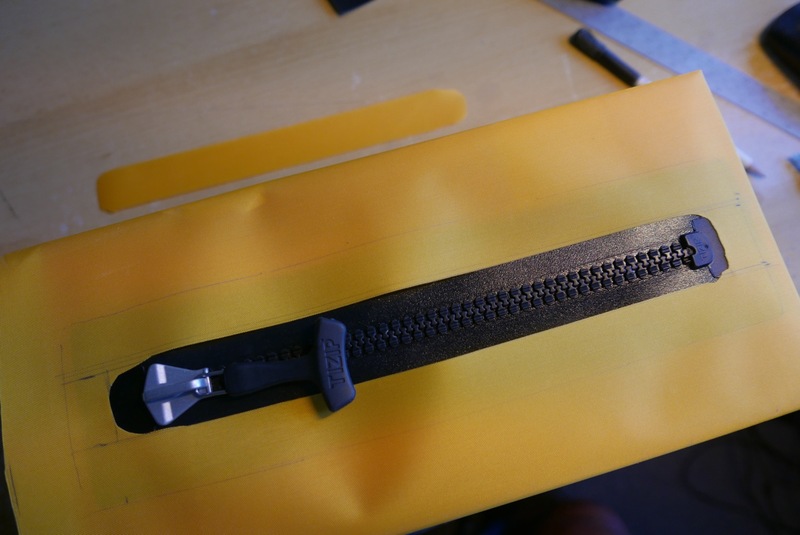 One interesting observation about joining fabrics by sewing or heat-welding is that millimetre-precise measurements aren’t critical as they are with wood or metal. I took more time than I needed cutting the exact forms and trying to get precisely perpendicular edges. A big metal set square may help, or you can find stuff round the house – in my case, some square glass bathroom scales. 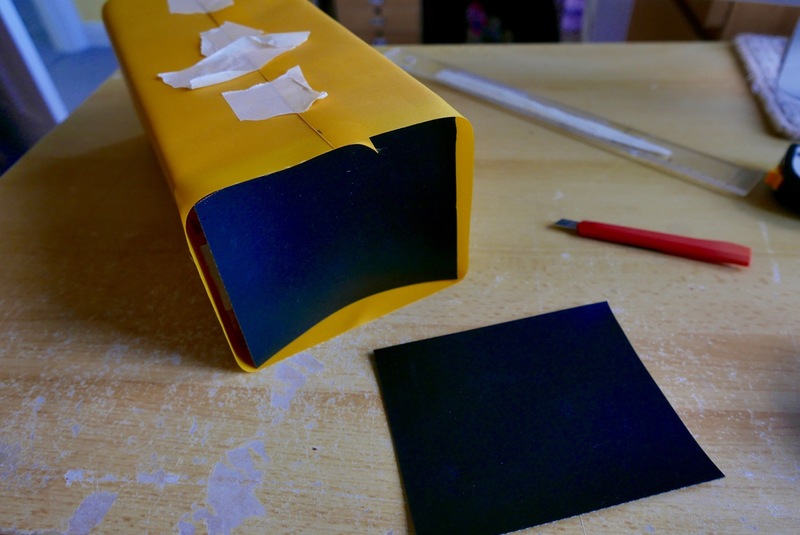 Another tip is arrange something sticky under your cutting edge ruler so it doesn’t slip as you slice hard to get a full, straight cut. The length of the bag is partly governed by the available zip size. The 23cm MS10 Tizip which extrem sell is presumably used as a relief zip on men’s drysuits, but for a bag has a minimally useful aperture of just 19cm. The next size they sell is a massive 71cm. They must make TiZip sizes in between (for example for packraft cargo hulls), but good luck tracking them down online. 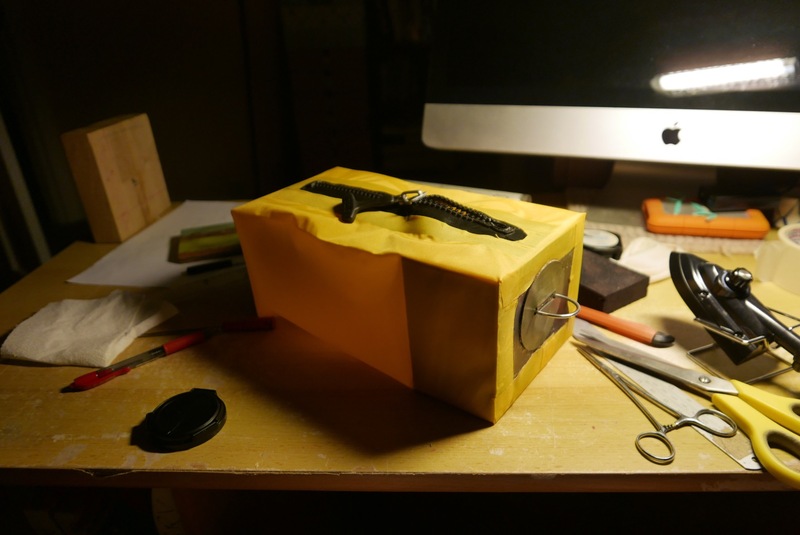 First job was wrapping the bag body panel round the box mould and sealing it. Cue endless to and fro with the iron to try and get a complete seal before I gave up and accepted I’d glue up the gaps later. Looking back, I should have made this join on the top of the bag, either side of the zip. 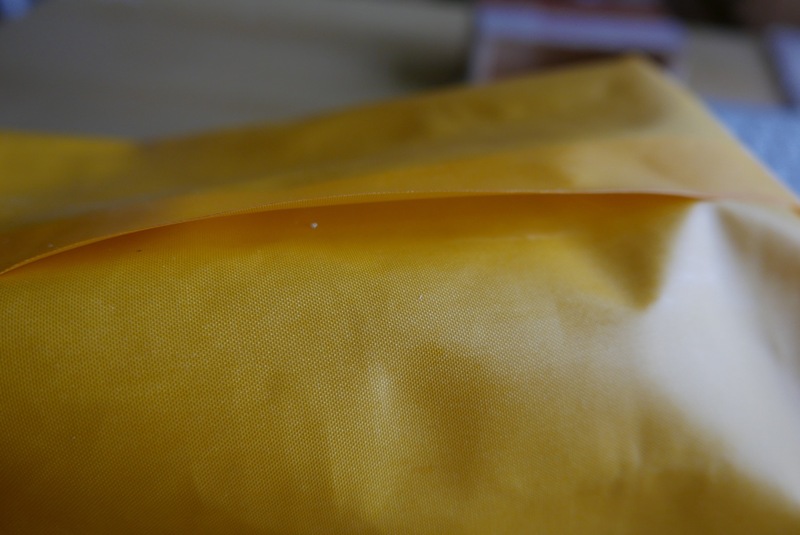 Barely two inches of yellow to yellow sealing required here. Now I know. 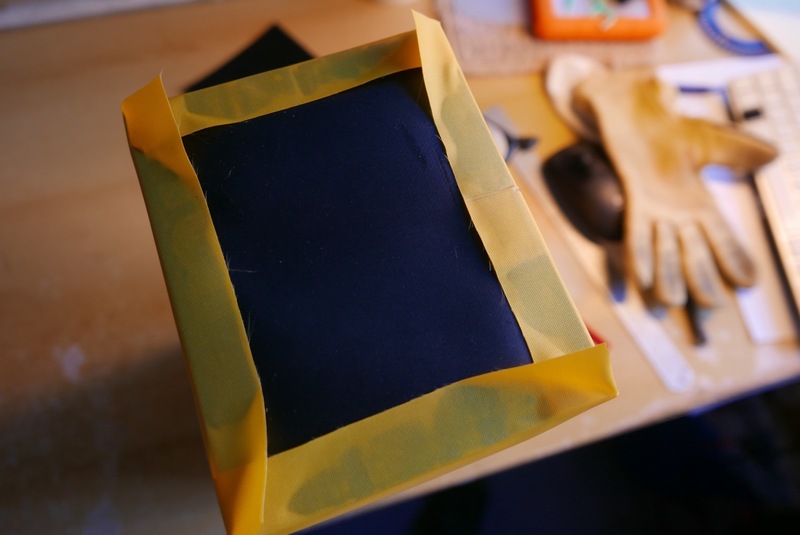 I dropped a black end panel on to the end of the box mould. and welded down the bits between the corners. Then I made an incision at each corner, pressed the flaps down over each other and welded on. Good to know the 210 welds much better to the thicker coated black stuff. Sealing wasn’t perfect but all along I expected to have to hand seal all joins, and certainly all corners with Seam Seal. Before sealing the other end, I cut a slot for the zip. Then ironed it down. Again, the thick coating on the broad zip sides made good adhesion easier to achieve. I stuck a home-made D-ring on the finished end. I actually needed this to pull the bag off the tightly fitting box mould before doing the other end. 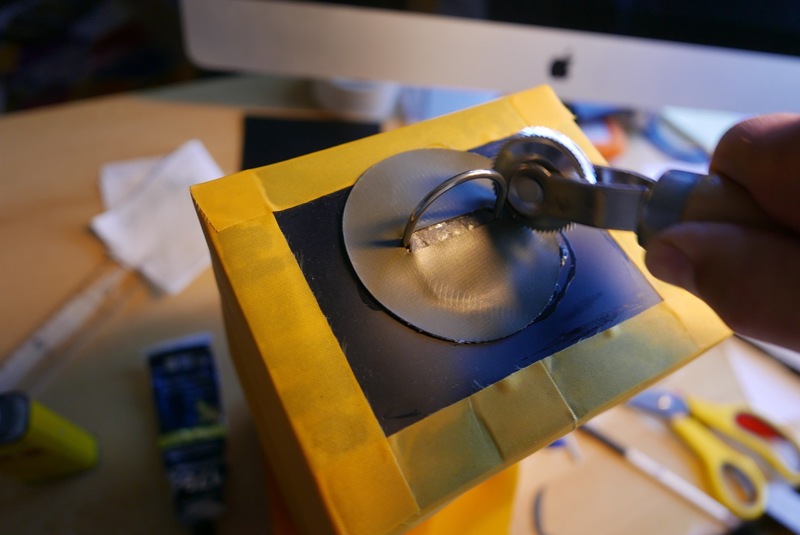 This requires sawing an end off the box so it can be removed through the zip hole after butting up against the unfinished bag end to support firm heat welding. Oh dear, look at the state of that floor seal inside the bag. 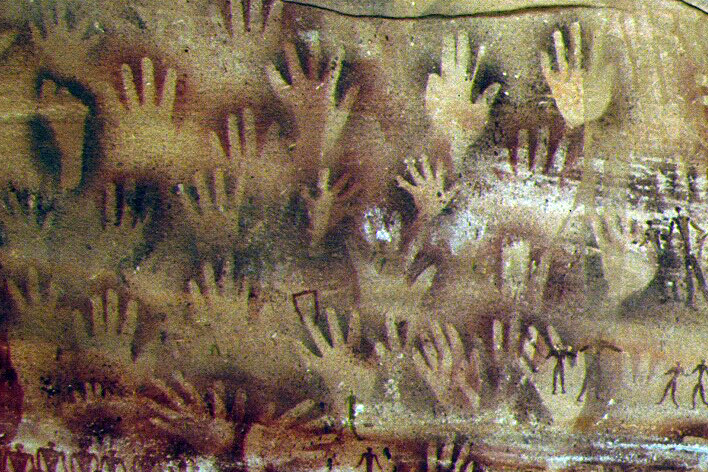 I went over it again with the iron, then filled up the gaps with glue. Then I stuck the zip cut-out over it for good measure. Once inverted, I did the same on the outside for more good measure. It’s not pretty but it ought to seal. 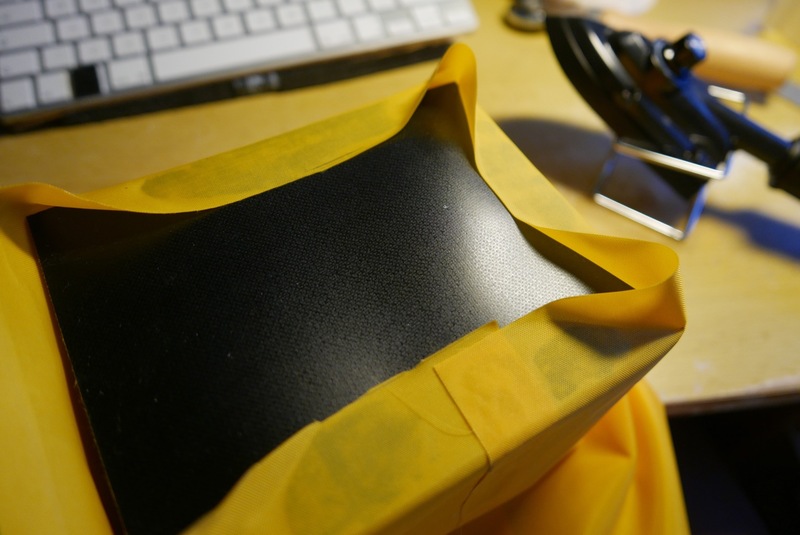 With the bag still inside out, I went round the yellow-to-black joins with Seam Seal. It’s like Aquasure/Aquaseal, but runnier and takes a long time to dry. Beautifully sealed seams. 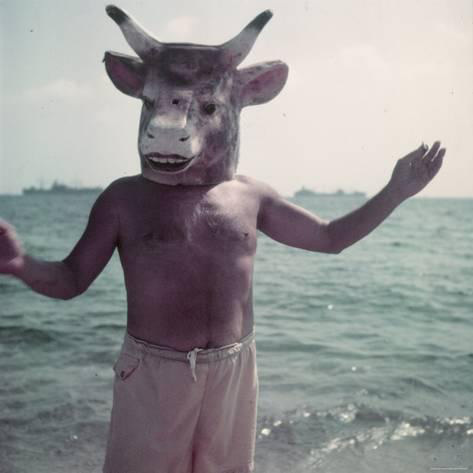 I should get a job at Alpacka. The bag turned right way out. I’m amazed that it looks less crap than I expected. No need for stiffeners; as hoped, the 420 end panels retain the boxy shape. The box mould (sawn off bits in the foreground) helped greatly in making a tidy form. Without the strap the bag weighs 158g or 5.5 oz. 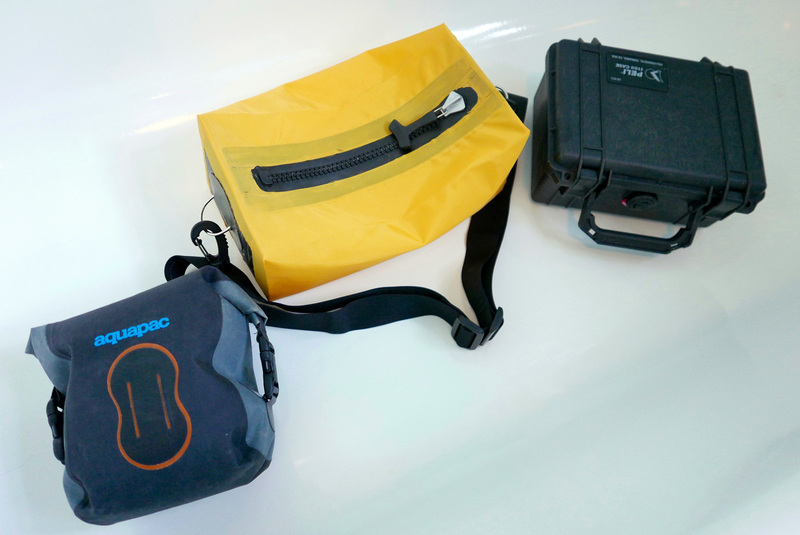 Completed Pakbag alongside the Aquapac and a Peli 1150. 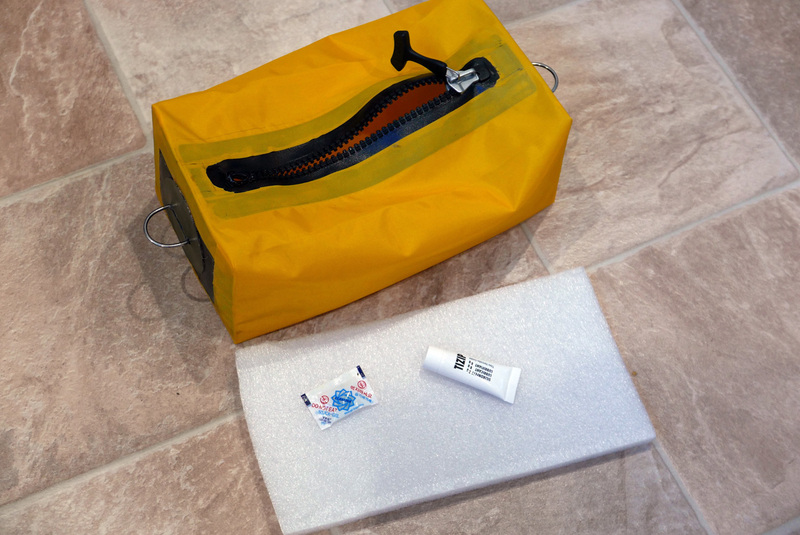 Pakbag, with a foam floor panel to keep above any moisture. 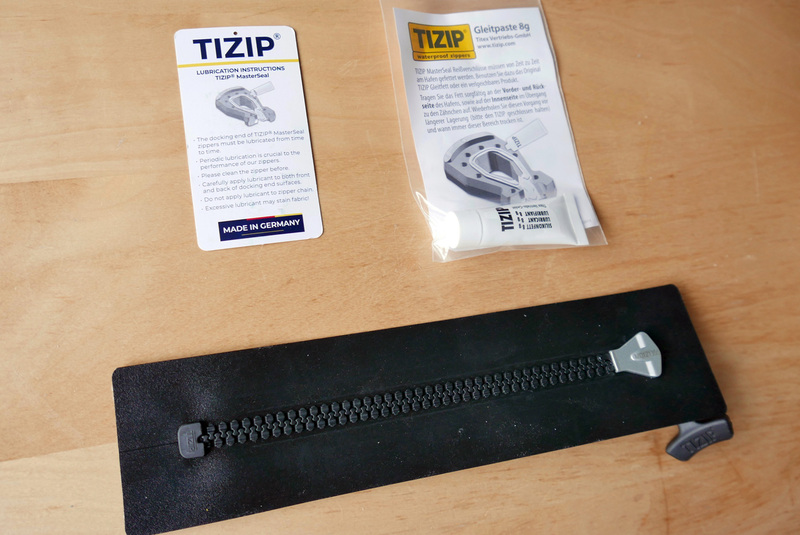 A sachet of silica crystals may help humidity, as does TiZip silicon lube for the zip end. It passed the submersion sink test. • TiZip is not diagonal – not important – but the arched stays idea underneath it may be. I noticed in France under the knees gets a lot of drips off the paddle (PSZ; right) which can get in when you open up. After paddling the Wairoa River in New Zealand as a day trip, I can boldly claim my MYO Pakbag is fit for purpose. It’s just the right size for a water bootle, camera, GPS and wallet, even if the easy-to-use zip is a tad short for easy access. One thing I didn’t appreciate is that, slung over the shoulder while sat in the boat, the bag is still handy to access but keeps off a wet floor and is always attached to you. No need to think where it is. Sadly my glue or gluing skills are not so fit for purpose. I need to reglue the strap end-rings and a couple of corners. 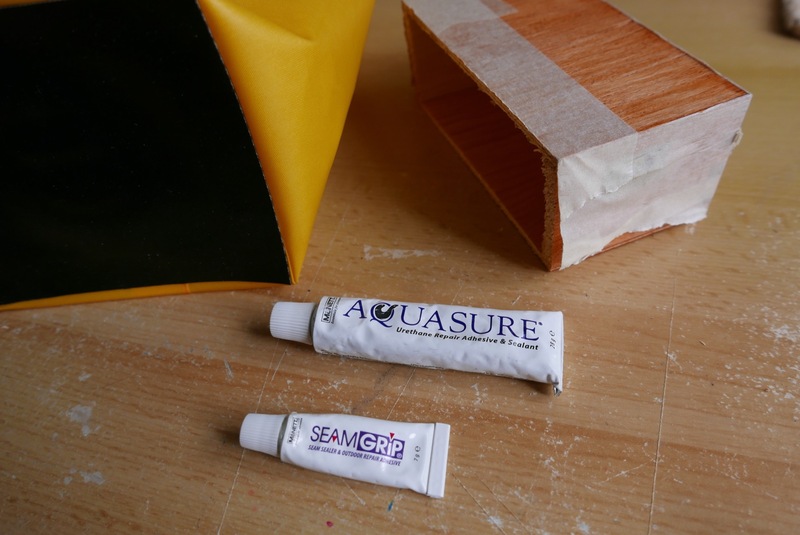 This time I’ll probably use 2-part glue which I know will tear off the coating from the fabric core before it separates from what it’s glued to. This entry was posted in Alpacka Yak, Gear, Inflatable Kayaks and tagged 23cm MS10 Tizip, Adobe Crayon, heat sealing, heat welding, heat welding iron, heat-welding TPU fabric, masterseal 10, MYOG, packraft deckbag, Pakbag, tizip, TiZip MasterSeal 10s, tpu fabric. Bookmark the permalink.